Home > About > Leadership > Elinore F. McCance-Katz, M.D., Ph.D.
Elinore F. McCance-Katz, M.D., Ph.D.
Elinore McCance-Katz, MD, PhD is the first Assistant Secretary for Mental Health and Substance Use. She obtained her PhD from Yale University with a specialty in Infectious Disease Epidemiology and is a graduate of the University of Connecticut School of Medicine. She is board certified in General Psychiatry and in Addiction Psychiatry. She is a Distinguished Fellow of the American Academy of Addiction Psychiatry with more than 25 years as a clinician, teacher, and clinical researcher. 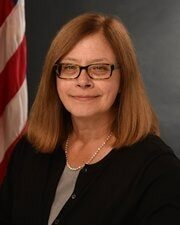 Most recently she served as the Chief Medical Officer for the Rhode Island Department of Behavioral Healthcare, Developmental Disabilities and Hospitals and as the Chief Medical Officer for the Eleanor Slater Hospital system which is Rhode Island’s state resource for patients with the most serious mental illnesses and medical illnesses requiring long term, inpatient care. She was also Professor of Psychiatry and Human Behavior at Brown University. Previously, she served as the first Chief Medical Officer for the Substance Abuse and Mental Health Services Administration (SAMHSA). Prior to coming to SAMHSA, she served at the University of California, San Francisco as a Professor of Psychiatry, as the Medical Director for the California Department of Alcohol and Drug Programs, and as the Medical Director of SAMHSA’s Clinical Support Systems for Buprenorphine (PCSS-B) and Opioids (PCSS-O). Dr. McCance-Katz has published extensively in the areas of clinical pharmacology, medications development for substance use disorders, drug-drug interactions, addiction psychiatry, and treatment of HIV infection in drug users. She served on the World Health Organization (WHO) committee that developed guidelines on the treatment of drug users living with HIV/AIDS. She has been a national leader in addressing the overprescribing of opioid analgesics and in providing consultation on management of patients with chronic pain and opioid overuse. She was a participant in the development of SAMHSA TIP 40 which provided the initial guidance to physicians utilizing buprenorphine in the treatment of opioid use disorder, contributed to the development and maintenance of the legislatively required 8 hours of physician training for prescribing buprenorphine products and has continued to be actively involved in the development and delivery of physician training on office-based treatment of opioid use disorders. She has been one of the architects of Rhode Island’s plan for addressing the opioid epidemic including new approaches to treatment in the form of a statewide system of Centers of Excellence in the treatment of opioid use disorder, new approaches to training in the utilization of DATA 2000 (Drug Abuse Treatment Act of 2000) to bring DATA waiver training to medical students, and going forward, nurse practitioner and physician assistant students, and legislative/regulatory work addressing safe use of opioids in acute pain. Dr. McCance-Katz lives in Cranston, Rhode Island with her husband. She has three grown children and one grandchild.